1. Thanks for Voting Us Best of Essex We are pleased to announce we have won this years "Best of Essex" Specialty Store 2015. 2. Community Art Project at Bullock School Special thanks go out to another community institution, Red Star Paint on Bloomfield Avenue in Montclair. The paint and decorating store generously donated all the paint and brushes. 3. Parents Give Verona High a Makeover The paint that spruced up the table, chair and walls was donated by Rich DiGeronimo, a Verona resident who owns Red Star Paint & Decorating in Montclair. We know you can go numerous places for paint and widow treatment. At Red Star, we pride ourselves on making you feel right at home, and promise to give you the attention and guidance to so that you leave with the product you want, and feel good about it too! There's a reason folks keep coming back to us: Our experience. We have been satisfying customers for over 20 years with our focused knowledge on color, design, and window treatment options. Customers know to trust us for bringing their design ideas to a perfect finish. No reason to deal with a home superstore or big box depot for a can of paint or a brush or accessory. There's parking on street in front of Red Star and parking in a rear lot, too. Grab lunch or dinner at one of our nearby restaurants when you're here. Why Red Star for Paints and Window Treatments? Family owned for over 20 years! Same convenient location for 50! Why wouldn't you go to Red Star for your paint and decorating needs! 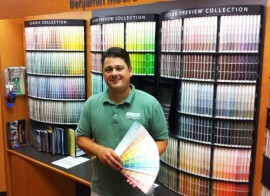 Unlike the big box stores, Red Star has showrooms that are easy to navigate, with a huge wall of paint colors in one, and a roomful of Hunter Douglas samples in the other. 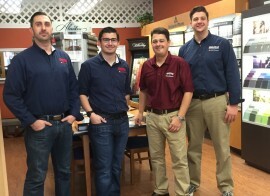 Our knowledgeable staff will help focus your project requirements to provide you the best integrated solutions for both paint and window treatments. Did we say family-owned and operrted for over 20 years?